I've talked about The Slayers franchise twice before. Once with the first film and again with Slayers Return. Thus far, it's proven to be a solid franchise. Let's see if it can maintain that with our third look at one of their instalments. We open with our heroine, Lina Inverse arriving at a town where they build golems with her frenemy, Naga the Serpent. They save a young girl from a rampaging mechanical bull and she insists on repaying them after their aggressive insistences that she doesn't need to do anything for them in return. The pair quickly find themselves caught up in a squabble between two lords who both want to rule the city. The biggest issue in the film is probably that a lot of the "twists" are pretty obvious. But this is also one of those works where the plot isn't all that important. The japes and sense of humour are the main draws. Therein lies the strength of the film. The humour is pretty spot on. You can generally predict where the plot is going to go but the gags that are going to go with it aren't so readily pinpointed. Which does result in a viewing experience that's generally compelling, entertaining and pretty damn funny. One of the strongest element of these early instalments in the Slayers franchise is pretty definitively Lina & Naga's dynamic. The whole idea of them being not so friendly rivals who still journey and work together until it suits them not to leads to some really good comedic moments. They also do a good job of making the characters who exist solely for this film quirky enough to add to the entertainment without spending too much time with them and bogging the whole thing down. The film looks quite nice. The characters are well drawn. It has strong visual gags. The action sequences flow really well. There are some nice details in the backgrounds. The only thing I'm a bit on the fence about is that the more fan-servicey gags might be a bit much in this one to the point where they arguably cross over from jokes into just being fan-service. This is one of those works where you'd have to have atrocious directing to go wrong with the cast. Hayashibara Megumi & Kawamura Maria reprise their roles as Lina and Naga. They continue to be fantastic. Our major supporting characters are voiced by Koyasu Takehito, Inoue Kikuko & Katou Seizou. All of whom do a great job. The soundtrack is also quite good. Particularly the ending theme tune, Reflection. Which, like most tunes n this franchise, is sung by Hayashibara Megumi. And, like those other songs, it's going on my MP3 player. There really isn't any. I'd make a joke about how Lina and Naga should just stop being tsundere towards each other and have lewd relations, but their relationship legitimately doesn't come across as being like that. Not that I'd mind if their relationship was like that since the eventual "romance" we do get is kind of bad and that might be more palatable. Slayers Great is, ultimately, a very entertaining film with a strong sense of humour, great acting, great artwork & animation and strong comedic characters. In the end, I'll give it a solid 8/10. If you've tried and enjoyed any of this franchise, this is for you. If you haven't, I'd start with the first film and work my way up to this one. This is going to be a short review. I thought I might write a review for this anime, since nobody else has. 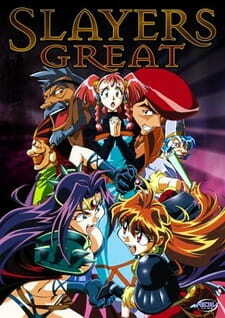 Slayers Great is the third Slayers movie (and the fourth Slayers installment to feature the voluptuous Naga overall), and I must say that while I feel the movies and OVAs didn't capture the magic in the same way the series did, this movie scratched an itch...at least for me. The story has the same hilarity and spectacle as a typical higher-tier Slayers story. Two golems, one modeled after Lina and one modeled after Naga, duking it out? You better believe it's a classic. As for the art, I feel the art was pretty good on this OVA. The fluidity has stepped up since last time, so that's a step up. I would give a decent score to the art. When it comes to the sound, I loved it. I especially loved the hollow, jazzy music that played at the start of the aforementioned golem fight. The rest of the soundtrack is very whimsical as well. The non-musical sounds, such as the ambient bird sounds, were worthy of praise too. All around, this anime was an aural pleasure. What do we have for characters? Well, we have Lina and Naga, who are funny as always. When it comes to the unique characters, we have the timid Laia, who takes delight in the madness all around her. We also have Laia's father, a golem sculptor, and her brother, also a golem sculptor. Watching the two clash might hit home for some viewers, but the two are idiots and not that different from each other. There's also these two kings, and I won't say much about them, except that they looked like they walked straight out of a circus. All in all, this is a fun romp that is a microcosm of Slayers at its best. The golem fight, which I know I keep bringing up but it's the focal point of the entire movie, captures all the high-flying action and gut-busting hilarity we know and love. If you have the time (it's only an hour), I would recommend checking this one out. It really lives up to its name, because it's pretty great.